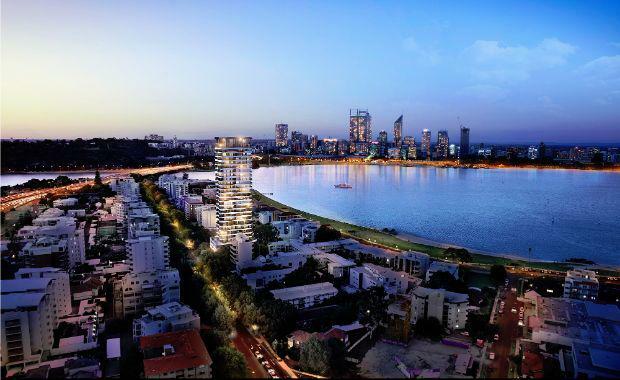 Edge Visionary Living’s $60 million Lumiere residential tower in South Perth is one of a spate of luxury residential towers planned in the riverside suburb. While the project has attracted some opposition from locals who don’t want hi-rise living in their area, its design quality is beyond doubt. Designed by Hillam Architects, Lumiere is a twenty five-storey residential and commercial tower setback above a four-storey podium. Balcony View[/caption] At this height on the peninsula, residents will enjoy panoramic views across the Swan River, to the city and beyond. One of the development’s unique features is that most apartments boast river views. Despite having 29 storeys, the development has only 91 apartments, each with a wraparound balcony. More than 60 per cent of the apartments have already sold, with prices ranging from a 1 bed 1 bath for $550,000, 2 bed 2 bath for $790,000, and 3 bed 2 bath for $1.9 million. Entrance[/caption] Each residence will have access to its own private wine locker, in a temperature controlled wine cellar on Level 8. The development also features a 15 metre infinity and an entertaining area with outdoor kitchen facilities. It has a fitness centre, a sauna and spa. The residents lounge offers panoramic views, an open fireplace, a private dining room and fully equipped kitchen. It also has a theatrette with first class audio and visual technology which is available for hire. Penthouse[/caption]Purchasers can tailor their apartments, choosing from three colour schemes for all materials and finishes. Further upgrades are available for those wishing to take their apartment to the next level of luxury. Each apartment comes with ducted reverse-cycle air conditioning to all living rooms, bedroom and common areas and engineered wood flooring or large format porcelain floor tiles, or an optional upgrade to natural stone. Common Room[/caption]Kitchens have Miele appliances including 4 zone electric cooktop, wall mounted built in oven, dishwasher, range hood with exhaust ducted to outside air, a combination of pressed porcelain and engineered stone benchtops and large format, seamless pressed porcelain splashbacks. Kitchen[/caption]Bathrooms feature a stainless steel sink with designer tapware, full height, floor to ceiling fully rectified quality tiles shower recess provided with two glass shelves, finished with a beautiful mosaic feature tile. Not only do buyers have a choice of three colour schemes but they can also choose from a selection of appliance, finishes, tapware, and lighting upgrades.